To optimise the production of highly caloric residue-derived fuels for the cement industry the Austrian company A.S.A. installed A TEC’s Rocket Mill® RM 2.50 double in their treatment plant in Wiener Neustadt. 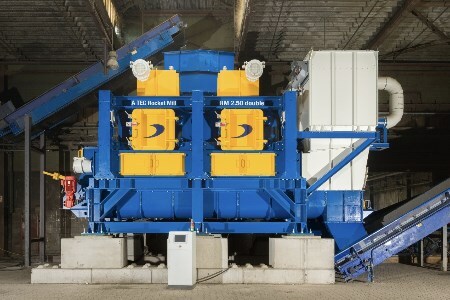 Pre-sorted and shredded household and commercial waste with a bulk density ranging from 100 – 300 kg/m³ can be grinded down to 15 mm in only one step (depending on the size of the sieves). The material has excellent ignition properties due to a change of physical properties (higher specific surface). Mainly produced by A TEC Plant Construction in Eberstein, the mill has a capacity of 7 – 40 tph and is equipped with two grinding chambers which can be independently loaded. Each one has a main drive of 315kW. Due to the grinding technology an additional drying effect of approximately 10% is given. The mill is also easy to maintain (no knives) and insusceptible to extraneous material and heavy items.